Every once in a while, I check the websites of few favorite performers, including hers, in the off chance that tour schedules will bring them close enough that we can attend a show. 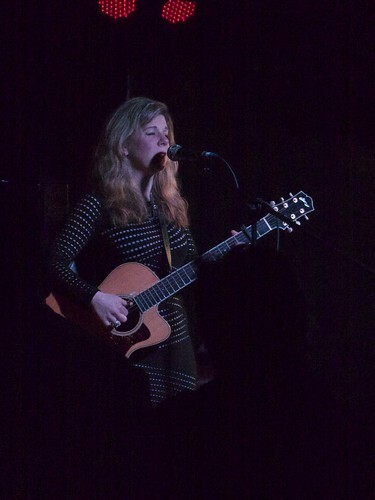 The last time I did this, deep in the depths of last winter, I was amazed to find that Dar Williams would be performing in York, only half an hour away from us, on our anniversary. I have been a fan of hers for a long time, ever since the beginning of college, and Jenny has been a fan since about the time we started dating. 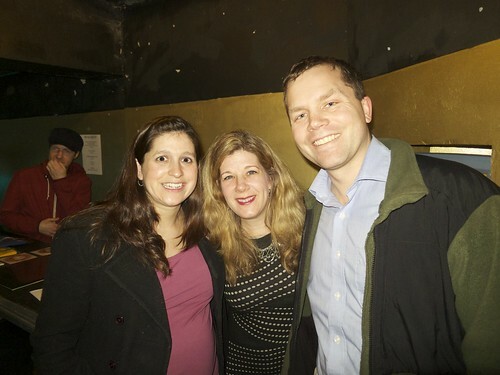 When we were newly wed, we attended a concert of hers in Austin. It didn’t take much to convince Jenny that this was what we should do to celebrate our special day. In Texas where we were married, at the beginning of March the short winter is already a distant memory, but here in Yorkshire the days are still short, the weather is still cold and wet, and spring is just a hope, not an imminent reality. Despite the differences in conditions, when we left the children with a trusted sitter and climbed into the car, I felt a renewal newlywed excitement and sense of adventure. 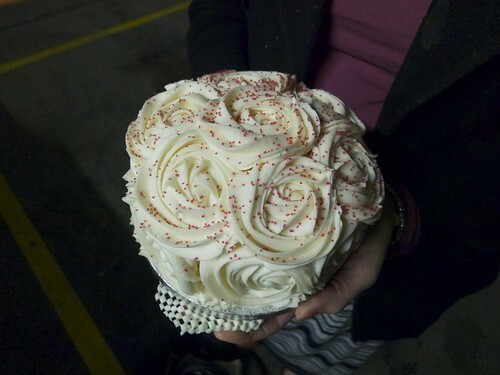 When we got to the venue and found parking, Jenny unveiled a surprise—a beautiful cake, perfectly suited for the two of us, especially since the proportion of frosting to cake was heavily weighted towards frosting. We had a little taste before we left the parking lot. The concert venue wasn’t easy to find; we eventually figured out that we could access it through a basement entrance in a nondescript municipal building. Judging from the fact that the stage had a waist-high railing all the way around, we figured that folk pop performers and audiences were somewhat out of the norm for the venue. The few chairs that were around were already filled when we arrived, but we found a little stair step at the edge of the room where we could sit; most of the audience (probably between 50 and 100 people) found little spots like this. 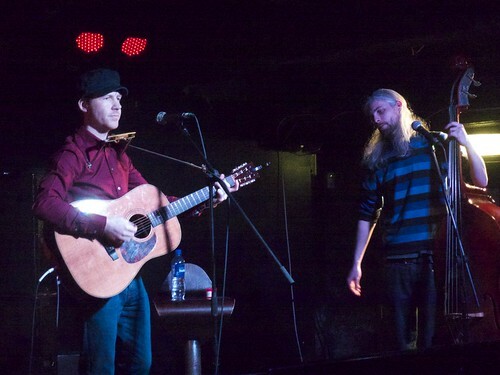 Not too long after we got comfortable, Malojian, an Irish duo, came on stage for their set. I’m not much of a music reviewer, but I liked them; their music was sweet and mellow. For me, the most memorable moment was when the lead singer talked about how he was the father of a young child, and how that influenced his songwriting; then they played a new song about bath time. Although the audience was polite and appreciative of Malojian, it was clear that they were really there for Dar. When she showed up on the stage, a large number of people moved from the back of the ground right up to the edge of stage—maybe the protective railing was necessary after all! As much as the fans loved her, she loved them right back. It seemed like she recognized people from previous visits to this area. She even said that, due to some special requests, she had been persuaded to go into her back catalog and play some songs that she doesnt typically include in her current repertoire. Although she had been working on remembering all the lyrics, she asked for us to help in case she got lost. It was a great show, a good mix of classics and new material, with lots of stories and commentary gluing everything together. As with any good folk concert, she invited us to sing along a couple of times; Jenny might have thought I was going a little overboard during The Ocean, and possibly gave me some funny looks when she noticed me really into it, singing along under my breath to some of the other songs. After the performance, Dar and the guys from Malojian came out to meet the fans. Jenny and I were just sort of waiting off to the side when Dar appeared right next to us. We said hello; her first comment was to congratulate Jenny on the pregnancy and wish us luck. She may have been a little surprised to hear our American accents; we made a little small about how, like her, I had gone to college in New England, and about our family now. We didn’t want to monopolize her time—the next people in line took a picture of us with her and then we headed back to our delicious anniversary cake, which we ate as we drove home. It was a great date, and a great night out together. I’m looking forward to many more years of love and adventure with Jenny!